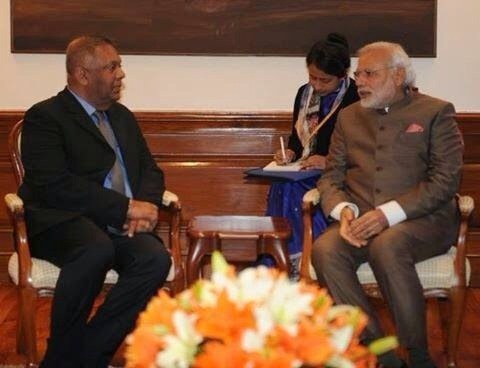 Mangala Samaraweera Reveals in India the Real Political Agenda of the new Sri Lankan Government . Who and what do we take more seriously? Prime Minister Ranil Wickremesinghe’s promise made to the Sri Lankan parliament of ‘the implementation of the 13th amendment within the unitary state’, or that which his Foreign Minister Mangala Samaraweera has disclosed in New Delhi, India, while “talking to a select group of journalists”? I’d go with the latter, not only because of the venue, but also because Mr. Samaraweera is known to be the bridge between Mr. Wickremesinghe and his influential political ally and partner, Madam Chandrika Bandaranaike Kumaratunga. What is the Foreign Minister upbeat about pulling off? ‘National reconciliation’ it would seem. Why has no one pulled it off as yet? Going by Minister Samaraweera’s version it was because “there was no political will”. I am deeply appreciative of this perspective because I had mistakenly thought for thirty years it was because of the war and the obduracy of the Tigers, and in the decades before and the half-decade after the war, it was the lack of broad bipartisan consensus. Now I know different. It was the lack, not of consensus or of a reliable peace partner, but precisely of political will. Well, you live and learn. I also learned what Foreign Minister Samaraweera regards as the components and contents of “national reconciliation”; what the ingredients of “national reconciliation” are. Consensus at and within a roundtable process such as the Parliamentary Select Committee certainly isn’t one. “Who [would] go for a new Parliament Select Committee? There’s no need to reinvent the wheel.” That’s what he said, according to S. Venkat Narayanan. 2. “A domestic probe with UN assistance into what actually happened in the war zone in the months before the LTTE was militarily defeated by the security forces in May 2009”. To recapitulate (a) de-militarization (b) a domestic probe with UN assistance and (c) political proposals ranging from the Thimpu principles to Chandrika’s political packages. The problem is two-fold: not only is each and every one of these three points downright wrong and bad as policy, but the triangle they constitute is a recipe for catastrophe– a political and strategic Chernobyl. The North is a strategically ultrasensitive province because it is separated by only a narrow strip of water from Tamil Nadu which is much larger and several times more populous than Sri Lanka; which has been a source of repeated aggression against Sri Lanka over millennia; and in which there remains a large pool of hysterical pro-Tamil Eelam and anti-Sri Lankan sentiment. No country would de-militarize such a vulnerable border province from which separatist or irredentist pulls can originate. It would have been entirely different had Foreign Minister Samaraweera said “demilitarize Northern society”, which would have meant reducing the military footprint in the North to a point that it is not overtly and excessively intrusive and alienating. However, that is not what Minister Samaraweera said. He said “demilitarize the Northern Province”. It took the Union armies twelve years to “de-militarize” the defeated Confederate states of the South after the American Civil War, and that was despite the fact that the Southern states did not have a much larger and more populous neighboring state with a reservoir of secessionist sentiment. The new Foreign Minister should have stuck strictly to a pledge of fully implementing the recommendations of the LLRC. No less and no more. The LLRC listed several incidents which it said required independent investigation. Differently put, the LLRC recommended an independent yet specific and limited, domestic inquiry. That is not what Minister Samaraweera proposes. No legitimate, sovereign state which has defeated a terrorist army, has subjected itself to any inquiry within five years. Many states have taken three to four decades, and with good reason. Some, such as democratic Spain, an EU and NATO member, has rendered illegal, any inquiry even into the numbers of dead in a civil war that ended 75 years ago! Cambodia did have a domestic inquiry assisted by UN agencies as Minister Samaraweera proposes, but that was precisely against the defeated, genocidal Khmer Rouge, not against the legitimate army of the state– and in any case, there was a three decade lag between the inquiry and the events it investigated. the Thimpu proposals of 1985 were presented by a united front of Tamil Eelam organizations including the Tamil Tigers represented by Anton Balasingham. The main planks were (i) the recognition of Tamil nationhood, (ii) the right of national self-determination and (iii) the Northern and Eastern provinces as the traditional homeland of the Tamil speaking people. They were rejected out of hand by the UNP government of the day. Mr. Samaraweera represents a UNP government—albeit one that was not unelected as such. Precisely which aspects of the Thimpu proposals does he think should be permitted on the table? The Mangala Moonesinghe proposals contained a straight swap which was perhaps acceptable in wartime: federalism for de-merger. Is Mr. Samaraweera proposing federalism instead of the unitary state with devolution? The Chandrika packages proposed the removal of the term unitary and the re-definition of Sri Lanka as a “union of regions”. These proposals could not be implemented even while the Sri Lankan state was under the gun of the Tigers. By what logic does Mr. Samaraweera think that compromises which the majority found unacceptable even during the war are necessary or will be acceptable after we have won it? Does Mr. Samaraweera think that any of it will get past the masses at a referendum or does his Government now possess “the political will” to push on without a referendum? Is this triadic “national reconciliation’, consisting of the “demilitarization of the Northern Province”, a “domestic inquiry with the assistance of UN Agencies” into the last months of the war, and a political outcome which takes as building blocks the Thimpu proposals and Chandrika’s ‘packages’, what our soldiers fought and died for? Is this what the war was for? Is this to be the political edifice erected over the great victory of 2009? « President Maithripala Sirisena’s Younger Brother Kumarasinghe Sirisena is Appointed as the new Chairman of Sri Lanka Telecom.